This excursion is now a confirmed event. We are now down to the last 5~6 seats on our excursion. The deadline for the downpayment is Friday, November 9. Pleases be aware you need to act sooner as there is some minor additional paperwork for payment to India that takes an extra day or so to transact. Please make your reservation now! Besides the Taj Mahal of Islam and the amazing Ganges River Hindu temples of Varanasi, we will visit some of the first monuments of Buddhism). 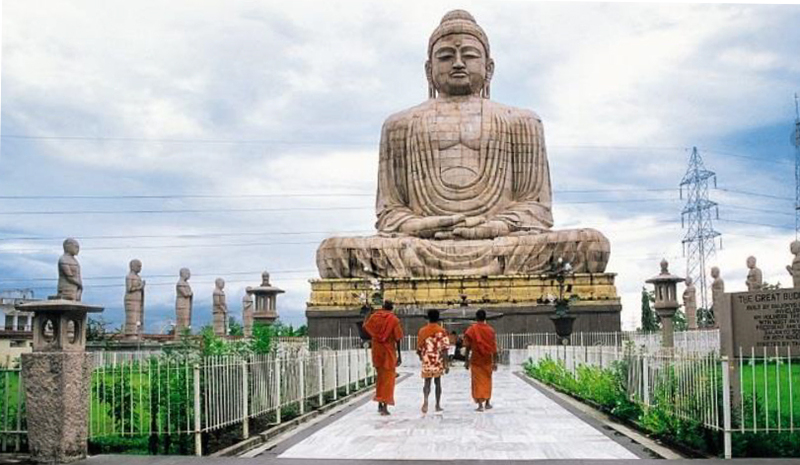 One of our Buddhist highlights will be a visit to the village of Bodh Gaya, site of the Buddha Shakyamuni's enlightenment. Bodh Gaya is the most revered of all Buddhist sacred sites. The main temple complex houses the famous Mahabodhi temple/stupa and a descendant of the original Bodhi Tree under which the Buddha gained enlightenment. Inside the Mahabodhi temple complex we will enjoy the Lotus Pond or the meditation garden. 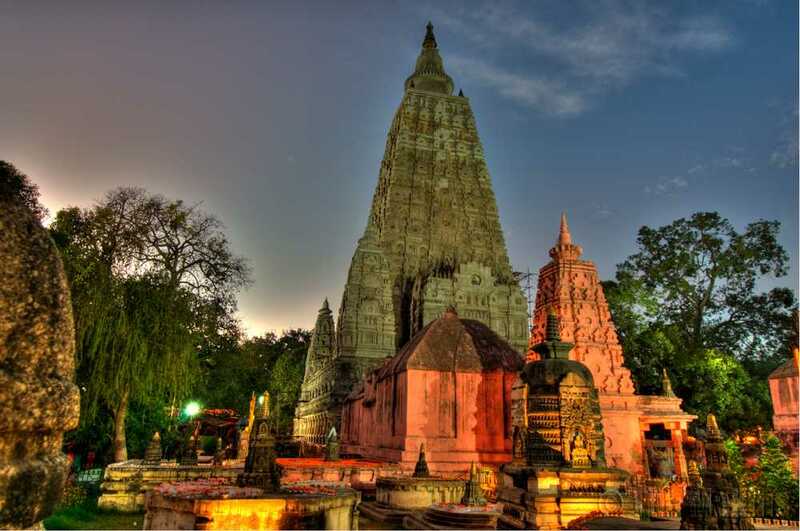 Bodh Gaya has temples or monasteries from many other nations with a Buddhist tradition (Bhutan, Bangladesh, China, Japan, Myanmar, Sri Lanka, Thailand, Tibet), all within easy walking distance from the Mahabodhi temple. We will boat down the Ganges River during sunrise, one of the main attractions in Varanasi. We will observe the Hindu way of life along the banks of the Ganges (Ghats) River. Varanasi presents a unique combination of physical, metaphysical and supernatural elements. According to the Hindu mythology, Varanasi liberates soul from human body to the ultimate. It is the Ganga Ghats of Varanasi that complement the concept of divinity. The Ganga Ghats at Varanasi are full of pilgrims who flock to the sacred river to take a dip in the holy Ganges, which is believed to absolve one from all sins. We will watch people come down to river in the early morning, take a bath in the mother Ganga, performing rituals, worshiping the Sun is a unique experience. 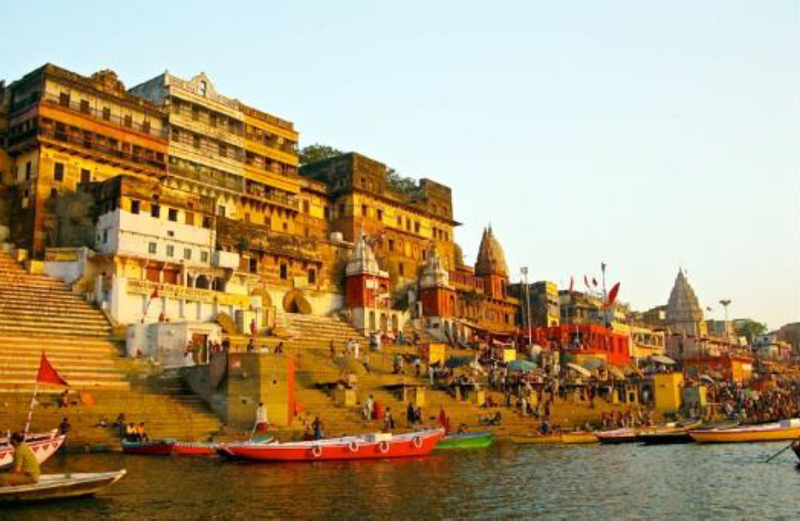 There are number of temples on the banks of the Ganges River in Varanasi. The old buildings, ashrams and palaces along the river side look as colorful as a rainbow when the sunlight hits them. It is at the Banaras Ghat where we will be able to see life and death together. There are numbers of Ghats alongside Ganges River in Varanasi. There are numbers of Ghats alongside Ganges River in Varanasi. We will make an early morning visit (the least crowded and most beautiful time of day) to the Taj Mahal, meaning "Crown of the Palace," is an ivory-white marble mausoleum on the south bank of the Yamuna river in the Indian city of Agra. It was commissioned in 1632 by the Mughal emperor, Shah Jahan (reigned from 1628 to 1658), to house the tomb of his favourite wife, Mumtaz Mahal. The tomb is the centrepiece of a 17-hectare (42-acre)[complex, which includes a mosque and a guest house, and is set in formal gardens bounded on three sides by a crenellated wall. The Taj Mahal was designated as a UNESCO World Heritage Site in 1983 for being "the jewel of Muslim art in India and one of the universally admired masterpieces of the world's heritage". It is regarded by many as the best example of Mughal architecture and a symbol of India's rich history. 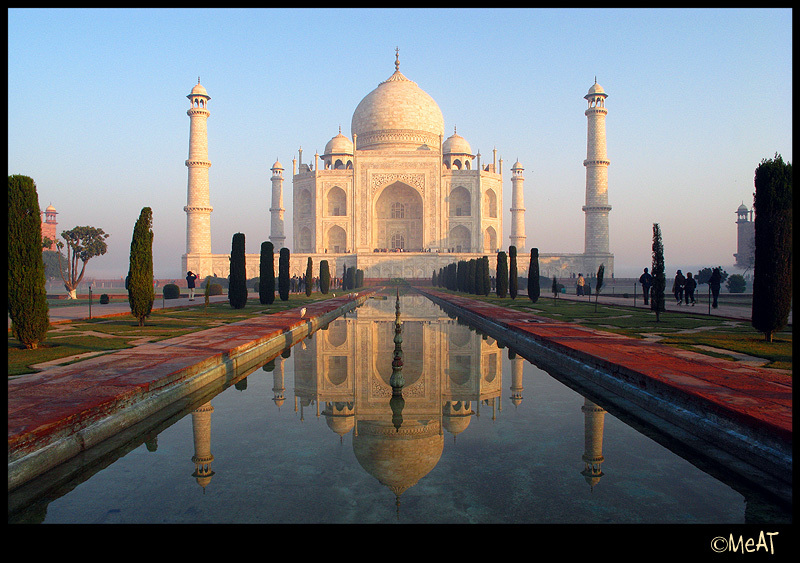 The Taj Mahal attracts 7–8 million visitors a year. In 2007, it was declared a winner of the New 7W onders of the World (2000–2007) initiative. For a complete, up-dated itinerary, please email us. For those people really serious about photography, they are encouraged to join Tom Coyner for at least optional dawn walk to photograph sunrise settings and early morning stirrings, followed by breakfast with everyone. Time permitting, Tom will give a mini workshop on travel photography. He is researching photographers' tips on how to best capture images of our destinations. Air flights round-trip between Incheon and Deli (flights K# 481; KE 6710 & KE 658) will vary in costs, depending on when you book the flight. We are not reserving a block of seats so as to have greater flexibility and to make possible cheaper flights for those people who book early. For general budgeting purposes, we recommend $1,100.00. Your price could be less, but if you wait until the last minute (no later than Dec. 14), you risk paying more. Inquiries for booking a flight from Incheon on Saturday, Feb. 2, 12:45 (KE/481), you should email Christy Kang at Christy_Kang@hotmail.com. Of course, you are free to book your own flight to Deli, but you must meet up with us on time at Deli airport at the arrival lounge by Gate 2 for Korean Air (KE) 481 by 1900 hours (7:00pm). *Final pricing subject to change. [Important] All bank (sending & reviving) /credit card charges are on senders. Korean Air fares are available from VaKang Travel. VaKang Travel handles only the airline bookings. Please note a 10% downpayment is due Friday, Nov. 9th. Recommend downpayment by credit card payment and final payment by bank wire transfer for least gross cost. For payment through Credit Card there will be additional 3% over the invoice amount towards Bank merchandising fees. Passport ID page copy (for photo and address proof). Your passport must be good six months following your visit to India. We will be flying out of Incheon on Tuesday, noon, Feb. 2, 2019 and returning to Seoul very early morning, Tuesday, Feb. 12. Again, you may book your independent flights to and from India. We have just 21 seats. But we have received assurances from our travel agency that we can add a few more people if needed. To guarantee places on this excursion, we are asking travelers to send Tom Coyner their passport images by as soon as possible. Later reservations may be accepted on an available space basis. The approximate 10% payment of $145 for double room occupancy, or $195 for single room occupancy, plus 3%, required by Friday, November 9. Simply click here to make your reservation by November 2. Please note that one needs not be an RAS Korea member to participate. Trip organizer Tom Coyner can answer any of your questions by contacting him at raskb1900@gmail.com or by phoning +82(0)10-9099-6195.